Whether your interests lie in office work, stewardship, exhibit design and maintenance, trail building and maintenance, gardening, assisting our teachers, or citizen science, we can use you here. Our volunteers help with a wide variety of one-time and ongoing tasks, and we would be lost without them. Are you looking to donate some of your time to help a very worthy organization? We might be just what you’re looking for. Volunteers must be at least 15 years old, unless otherwise stated. Volunteers under the age of 15 may volunteer with a parent or guardian, or if they are part of a group whose members consist of children under the age of 15, as long as the group provides all adult supervision, and the volunteer project is age appropriate. Any volunteer under the age of 18 must have a permission form filled out by a parent or legal guardian and on file before volunteering. 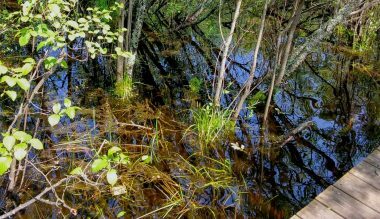 If vernal pools are not mapped, they are not protected! You can help! Hartley Nature Center is working in partnership with Boulder Lake Environmental Learning Center, and the Northwoods Vernal Pool Initiative, to support citizen scientists in an effort to locate, document, and monitor vernal pools in Hartley Park, Boulder Lake, and other areas of the Great Lakes Region. Monitoring these ecologically important wetlands will help us to protect and preserve these vital resources. • participating in local efforts to find and monitor vernal pools. local newspapers, schools and your neighbors! Hartley Nature Center is looking for volunteers to help with our annual anuran surveys. Participants are assigned an area in the park, and tasked with walking the route at night to listen for frog and toad calls at each location, and record data. Volunteers will walk the route 3 times, once during each survey period (early spring, late spring, and early summer). Volunteers must attend a training session prior to volunteering. We will be hosting training days on March 9th (at Hartley), and March 23rd (at Boulder Lake) for those interested in helping with this project and/or the Northwoods Vernal Pool Initiative! Hartley Nature Center staff have long worked along side volunteers to remove invasive species in the park. Volunteers help us in our effort to manage and control new and old infestations. This spring and fall will bring opportunities to help in the effort. Keep an eye out here, and on facebook for more information in the coming weeks. Two evenings per month we are hosting a volunteer project within our gardens here at Hartley Nature Center and would love to have you join us! Our evenings will be spent in either our Butterfly and Hummingbird Garden or Water Garden weeding, labeling plants, spreading mulch or planting new baby plants. Come to see what’s blooming in the gardens, learn about native plant landscaping, get to know your fellow Hartley supporters and enjoy your community-supported nature center. Stay tuned for information on evenings and times.